As you know, we’re currently conducting our pledge drive to raise funds and keep our servers running. We also have some very exciting auctions going on over at Ebay. This auction offers a beautiful 3-piece set of The Lord of the Rings Collector Edition Lithographs by prominent artist, Jerry VanderStelt. Best known not only for his works inspired by J.R.R. Tolkien, he also captures the worlds of Indiana Jones, Star Wars, and much more in the Fantasy/SciFi genre. 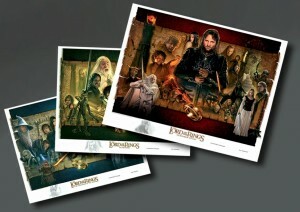 Each Lithograph of the 3-piece set has a unique Remarque or sketch drawn on the bottom left corner, signed separately from the normal signature and a certification of authenticity. These Lithographs are printed on a Heidelberg press using 200 line screen for superior reproduction quality, as well as utilizing “100 year” archival inks, and an aqueous coating for a protective finish. Each litho is made with heavy 100 pound paper and measure at 24 x 30 inches each. If you purchase the 3-piece set through BUY IT NOW, Mr. Vanderstelt has offered to personalize each Lithograph. Your prize will also be shipped to you directly from the Vanderstelt Studio, which is a site you must visit to see his stunning work up close. Jerry VanderStelt’s life-like detail and style of artwork gives each of his subjects a rich depth and beauty that’s impossible to describe. This copy has found itself travelling to DragonCon 2013 where it has been signed by two of The Hobbit’s Dwarves — Dwalin; Graham McTavish and Bifur; William Kircher — for TORn’s Fundraiser! It also has two of the articles signed by their authors. 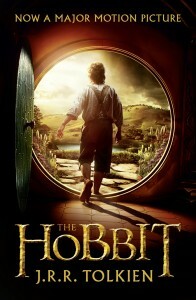 A collaborative effort between Topix Media Lab and your friends here at TheOneRing.net, this tribute to The Hobbit covers everything you need to know about The Hobbit movies from a fan perspective. 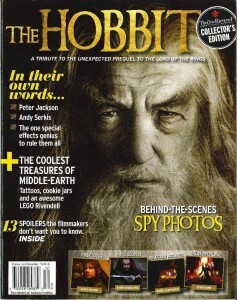 Side-bars and feature articles, contributed by our own volunteer staff, include interviews, a feature on book vs. the movie, articles on games and collectibles, a Middle-earth timeline, and much more! The high-quality, glossy paper used for this magazine is also packed with colorful pictures of cast and crew members, locations, collectibles, gorgeous fan art and a few exclusives! One thing that makes this truly a collector’s edition is that there are only two ads in the entire 82-page magazine. This is a NEW paperback copy of The Hobbit, by J.R.R. Tolkien with a movie tie-in picture from The Hobbit: An Unexpected Journey film released in December, 2012. This copy has travelled to DragonCon 2013 in Atlanta, Georgia and has found itself autographed by 2 Dwarves (William Kircher and Graham McTavish) for TORn’s Fundraiser Auction. Or click here to check out all our auctions!